Range in New Jersey: Common in the woods of the Northern and Middle districts, occasional in the Cape May and Coast regions, but absent from the Pine Barrens. Misc. 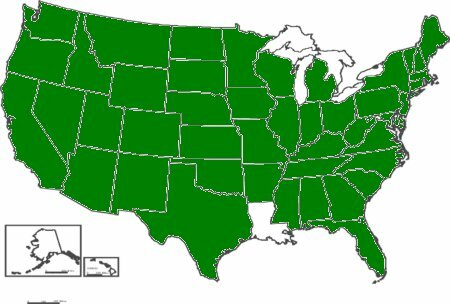 USDA lists as FAC, that is equally likely to occur in wetlands (estimated probability 34% - 66%) or non-wetlands. 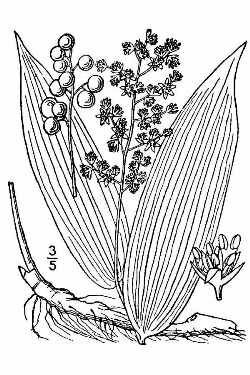 The leaves of False Solomon's seal resemble those of Solomon's Seal (Polygonatum pubescens), but the flowers on False Solomon's seal are very different and all found on a terminal raceme. According to Flora of North America, this plant may be apomotic (asexual seed production), but more work needs to be done to be certain. Historically the berries of this plant were used in jams and jellies, as well as to prevent scurvy. Large doses may act as a laxative, though this property seems to be destroyed with cooking. According to Moerman. D. , Native American Ethnobotany, Timber Press. Oregon. 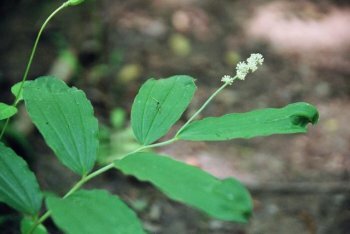 1998, Native Americans have historically used this plant for various ills such as cough, regulation of menstrual disorders, rheumatism, and more.